For people who ride on motorcycles, Hokkaido is a special place. When the season turns to summer, many riders visit this place like a flock of migratory birds. This feeling of stepping onto the land of Hokkaido from a ferry that has a smell mixed of oil and ocean brings an excitement that is hard to express in words. Once your on the road and happen to come across another rider, both the rider and yourself will raise a hand as a sign of greeting. It’s kind of awkward doing that in the main island of Japan, but this feeling does not appear in Hokkaido, and I think this is coming from the openness of the enormous island being stepped in. Once you leave the ferry terminal in Tomakomai, the first destination will be Furano. The town of Furano is located on the belly part of Hokkaido, and the purpose of visiting there is to stop over for a day to gather some information including weather, hear the local people’s story, and reflect on your feeling to decide where to visit next. Furano is known for its setting of the TV drama “Kita no Kuni Kara,” so the first thing to do at this place is to visit cafes and hot springs that are related to the drama. Through this, you change your mood in a way that suits to the land of Hokkaido. Unlike cars, bike ride exposes one’s body to the outside air, which makes it possible to smell various things on the way. 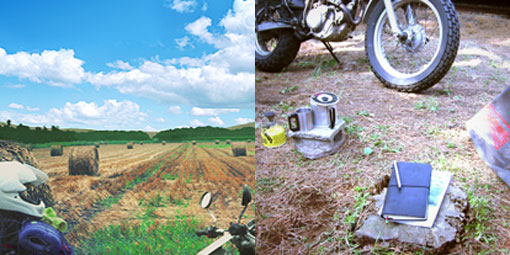 For example, when you’re riding on a slightly moist road in a morning dew, you can smell the grass, and when you encounter a group of cows on the way, the smell of the feces will attack yourself, but all those aspects seem to raise the sense of excitement of being in Hokkaido to another level. When you’re riding by the ocean, you can smell the salty air, and when you’re near a hot spring, you can smell sulfur, and that tells you the place you’re approaching. It’s also worth noting that rain and the cold air also hits the rider directly. Even if your riding in the summer, the rain that hits you can make you shiver. By the time you approach a drive inn and carry a can of hot coffee, you see people in T-shirt eating an ice cream. Despite how the season is the same, that’s how much it differs in terms of how you feel the temperature. Your body starts to harden from the rain and wind, and in a state like that, a hot spring is simply an oasis. In Hokkaido, there are a lot of hot springs that are free of charge, so on a rainy day, I would visit those places frequently to warm up my body and to wait for the rain to pass by. By the time your body gets warm and the rain becomes weak, you resume the tour, but the cold air still seems to hit your body. After going past a hill and approach a downhill, all of a sudden the cloud fades away and sunlight shines in between the clouds. The road that was wet from the rain starts to dry up, making its vapor visible. Also, the air that was cold for a while turns warm. From the top of the hill, the place I’m about to visit is made visible through a sunlight that functions as a spotlight. This seems as if my next destination is waiting for my arrival. I feel that those moments are precious and are something a rider can only know.